Find hotel near Monumento A Los Zapatos V .. Poet Luis Carlos Lopez wrote a sonnet comparing his affection for his nation as similar to the affection he felt for an old pair of boots, and how he would never give either up. 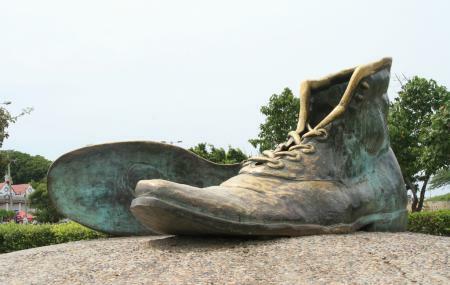 After the poem became famous, the sculptor Hector Lombana Pineres ended up crafting these bronze shoes as a monument to that sentiment. The toe of one of the shoes is kept shiny by the many visitors who take a seat while posing for photographs. You can actually climb into the shoes for a picture. Vendors peddling fruits and crafts throng about the place. It’s an amusing stop, but nothing worth going out of your way to see. Market place is tourist attraction...very busy. Monument large boots....makes nice picture. Nice picture spot but nothing else. Really sunny and normally crowned with tourists. Great part of history unveiled. Unknown story until we took the "RUMBA DE LA CHIVA". Nice place. Los Zapatos Viejos or as many know them "Las Botas Viejas" is in homage to the "Poet" Luis Carlos Lopez behind "El Castillo de San Felipe" in his native Cartagena, Colombia.